First off, I would like to make it very clear that I am a little annoyed at Mr. Shan. Not because Zom-B is bad. Bad it most certainly is not. But because he's made it so damn hard to review! Practically anything I say is going to spoil the book. Damn you, Shan! Why do you write something so freaking amazing but make it so freaking hard to talk about without spoiling those moments of shock and confusion that make the said book all the more amazing?! Gah! 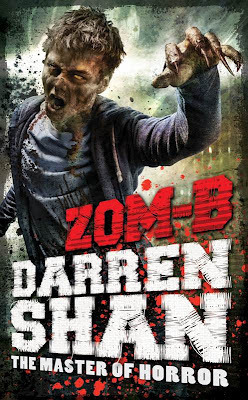 Zom-B is the first book in a planned series of 12! Yes, that's right. 12 books. 11 to follow, each one published three months after the last. But fear not. Shan is not afraid of writing long series. Cirque Du Freak stretched to twelve books, and his best series so far in my opinion, The Demonata was crafted into ten amazing books. They're quite short. I believe this book is just over 200 pages (I read it on my Kindle so went on the percentage...) but what they lack in size, they make up for in punch. The book kicks of pretty darn gory. Zombies are attacking a remote village in Ireland. Word spreads. And whilst people are speculating it was a publicity stunt, nothing more, there is always doubt there. The asking of, what if? Life goes on as normal for those outside of the village, and the book tones down on the gore, but something else comes to the foreground. Racism. I'd read the synopsis and saw that racisim is a theme in the series, but I'll be honest, I wasn't expecting it to be like this. It is quite strong in places but it is placed so well and written in such a way that you can't decide whether B, the main character here, is being series or not, or if they're just agreeing with their ogre of a father. That's all I'm going to say on the matter because there is oh so much more. And the twist! That twist. A massive one, right near the end. I'd heard it mentioned. On twitter, and in other reviews, and Mr. Shan himself tweeted me when I said I was reading the book that all is not as it seems and boy was he not kidding. In fact, when the twist occurred (I'd say 10% before the end on my old Kindle) I actually wondered if it was a typo and read it a couple of times. Huh... that doesn't make sense. What? No. Come of it. That can't be right... I kept reading and lo and behold, it was indeed correct. Well I'll be damned! Totally didn't see it coming and it actually made me feel a bit funny inside. A bit shocked. Brilliant stuff, I'd say. I have to say aswell, that I love the drawings placed throughout the story. They don't detract from the action like I had feared they would. Anything but. They add to it. Highlighting scenes, characters, blood. In fact, some of my favourite scenes were captured and it was great to imagine them, but also to be able to visualise them with the fantastic illustrations by a man called Warren Pleece. And the conclusion... ARGH! I CAN'T SAY A WORD! JUST... ARGH! I want book two, Zom-B Underground right now! Shame it's not out until the 3rd January. Such a long wait! One thing is for sure though, if it's anything like this first instalment it will be well and truly worth the wait! Thanks Mr. Shan for such an awesome read. Here's to another 11!